Do you ever feel like an ATM machine, everyone withdrawing energy from you and never giving back? Do you know someone who starts spouting self-hating diatribes every time you assert your own needs? Do you find yourself apologizing whenever you bring up your own needs? 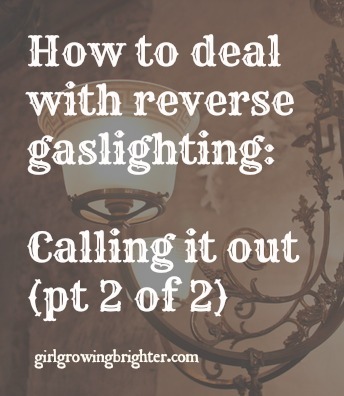 Could it be….. that you have a Reverse Gaslighter in your life? STOP! You deserve better. You deserve reciprocity. Call out the Reverse Gaslighter’s actions when they happen. Here’s why. When you call out the Reverse Gaslighter’s actions…..
3. You are acting respectfully in telling someone why you want to walk away, before you actually do it. It’s not so hard to call out the Reverse Gaslighter once you are able to spot their ways. Let’s look at a sample dialogue between you and the Reverse Gaslighter, and apply the call-outs to this scenario. Then you can tailor these to your own life. Dealing with the Reverse Gaslighter: Scenario A. You: I felt hurt when you kept saying you were going to “do it only because I’d asked you to.” I’ve done this for you many times. I would have thought you would want to reciprocate for me. Reverse Gaslighter: I am selfish. You’re not the only person to tell me how selfish I am. STOP! You deserve better than to apologize, or say something like, “You’re not selfish!” Instead……. let’s play a game. Boys, girls, gender-binary-non-conformists: It’s time to play fill-in-the-call-out-blank! The unofficial strategy name is noted in the [brackets] before each quote. Are the general strategies clear? Let’s play the game! The first catch: There are no promises that anything will change. Change takes a long time, and more importantly — it’s up to the Reverse Gaslighter, not you, to change their behavior. You could be at this for your whole life. So make decisions for yourself assuming this person may never change. The second catch: The Reverse Gaslighter might exit your life, because they will be angry with you for not giving them what they want — which is, for the relationship to revolve solely around their needs. So before you step into action, make sure you are committed to your answer: Who do you want to be? …..Do you want to be someone who goes along with the Reverse Gaslighter’s emotional manipulation? Who is always okay never getting your needs met? …..Or do you want to be someone who is true to yourself, even if it means that the Reverse Gaslighter might walk away? I hope that you will choose the latter. You will have to live with yourself for the rest of your life. You deserve better. You deserve to be treated well. And if the person in your life will not do this for you, you deserve to do this for you. When you set your standards high, some people will fail to meet them — but a few will more than surpass them. And those are the people you want to have in your life. Folks, I am not a trained therapist nor psychiatrist. I am just a diligent student of the world. I offer a POV based on the myriad people I’ve met, my own mistakes, and my personal research. Please make the decisions best for you as you heed (or not) my advice.